My girl...she is...OBSESSED....with strawberries. She eats them year round...fresh, frozen...it doesn't matter. They are absolutely her favourite thing to eat. She will shove them in her mouth until she can't fit any more...honestly...to the point of that I worry she'll choke...then those big squashy cheeks munch away with all that sweet red juice spilling out of her lips. We have a hard time keeping strawberries in the house. 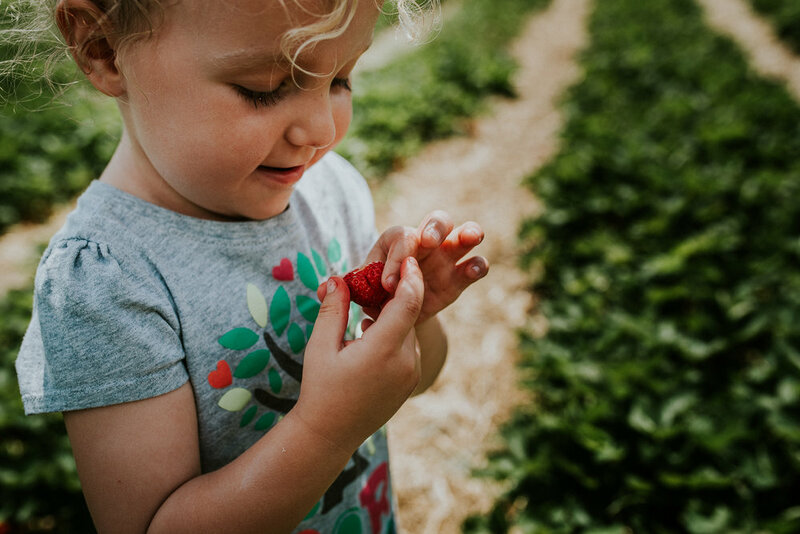 They aren't always in season here in Ontario and when they are, they last maybe a day with our little strawberry monster around. So, this year we decided to take her strawberry picking. I figured we could go out and get a nice big basket full and satisfy her cravings for more than just one day. I had been keeping an eye on the strawberry season for a few weeks, making sure we didn't miss "prime" picking time. I reached out to my fellow Dundas mums for suggestions on the best farms to take her to. I also had to be a little sneaky about it. I made sure not to tell her about it until the morning we were planning to go. Because, I've done that before...told her our plans for something exciting...and regretted it immediately. If we weren't going in that very moment...all hell breaks loose! Ever experienced that? Not. Fun. Anyways, the day came when the strawberries were ready we could finally let my sweet girl know...we're going strawberry picking today! 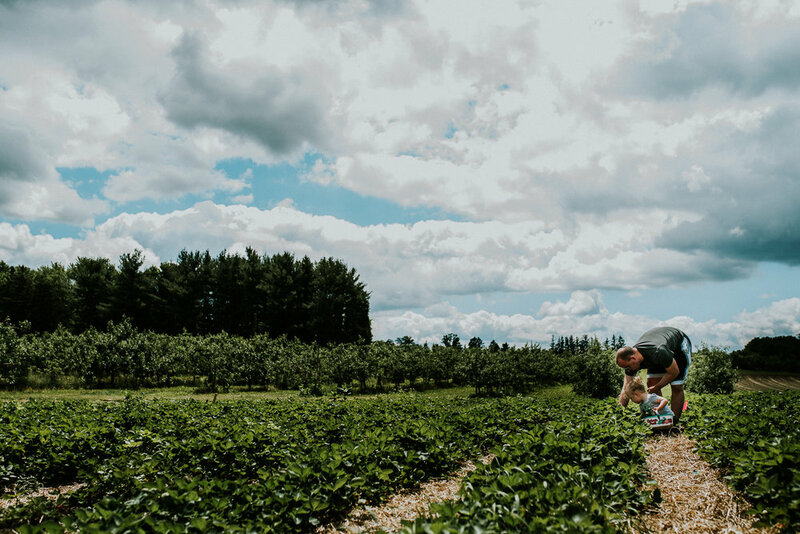 So we hopped into the car and during the short drive to Josmar Acres Farm in Lynden, every few minutes she would sing out to us "we're picking STRAAAAAAAAWBERRIES today!". When we arrived...she was so happy and excited! Pretty sure if she wasn't in a five-point harness car seat...she would have lept out of the window! We had to carefully explain when we got there that we had to fill our basket but we couldn't eat anything...pretty sure this was the hardest part for our girl...who...as previously mentioned...loves to shove strawberries into her face like they are going out of style. But she managed very well and was so excited to find the "great big juicy red ones" as we worked along our assigned row. And of course, nothing was stopping her from licking her fingers when she squeezed a berry a little too enthusiastically! 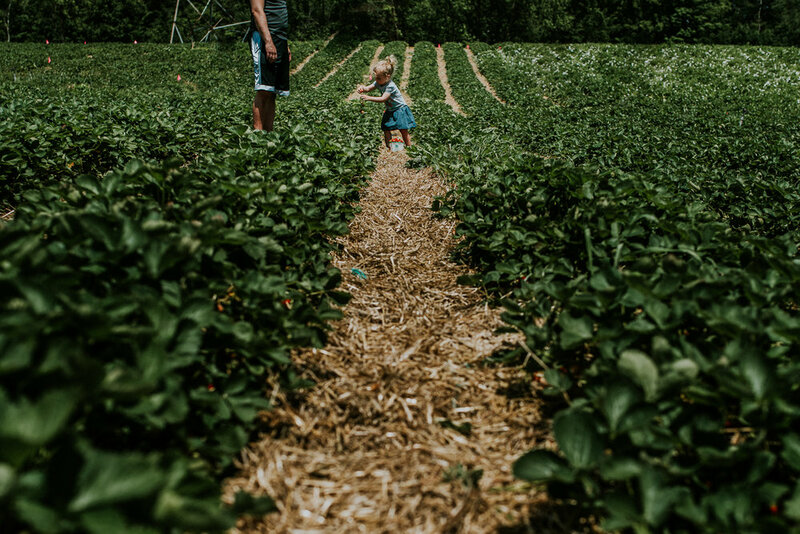 It was a gorgeous day out, and there is just nothing better than spending it outside with the family...but add in the delicious smell of fresh strawberries on the vine and you've got a perfect summer day. We filled our basket much more quickly than we imagined, and our girl was so excited to dig into them when we got home. In fact, less than a week later...they are all gone! So we will for sure be making a second, third and forth trip to Josmar Acres to fill additional baskets for our girl to devour before picking season is over! I would love be one of those mums who makes preserves and jams with the strawberries....but...pretty sure the berries wouldn't last long enough for me to actually do that. Maybe in a few more years! Does your family have a favourite fruit to harvest here in the Dundas/Hamilton area? Which is your favourite farm to visit? And if you're children don't eat them all at once...what is your favourite way to preserve those fruits? I've love to hear all about it in the comments below! Have you ever considered bringing a family photographer along with you on one of these adventures? Imagine updating your family photos while making memories all at the same time. P.S. The amazing smell of those fresh berries is so intoxicating! My car smelled so amazing with those fresh berries in the back!